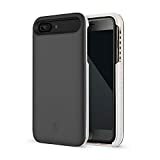 • The new soft rubberized edges with cushioned protective corners allow for easy removal of the phone from the case as well as superior drop protection. • 360° comprehensive bumper design and hard-shell backplate, protects your iPhone from scratches and other daily wear and tear, yet small and convenient enough to fit easily in your hand or in your pocket.Great for selfies, facetime, movies and lights up a Room. • Great for selfies, facetime, movies and lights up a Room.